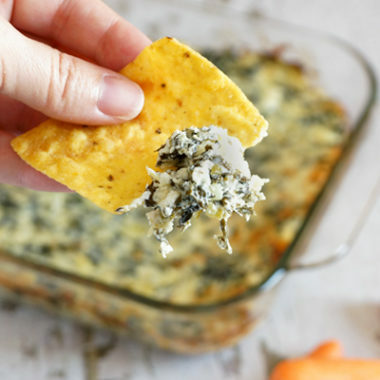 Easy Spinach Artichoke Dip is simple to make and a crowd pleasing favorite. Preheat oven to 350˚ and spray 11x7 (or 9x9) baking dish with non-stick cooking spray. Combined cream cheese and greek yogurt in large bowl. Add parmesan and mozzarella cheeses, mix well. Drain and chop artichoke hearts, add to bowl. Squeeze spinach in cheese cloth to remove all water, chop, and add to bowl. Add garlic and mix well. Spread mixture in prepared baking dish and bake at 350˚ for 20-25 minutes. Freezing instructions: Spread mixture in an aluminum disposable pan, cover, and place in freezer. Will store well for up to 3 months. To heat, bake at 350˚ for 40 minutes, or until heated through.